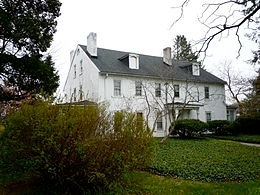 Drexel Hill is a census-designated place (CDP) largely located in Upper Darby, with a small section (Pilgrim Gardens) located in Haverford Township Delaware County, Pennsylvania, United States. Drexel Hill is located 7 miles (11 km) west of Center City, Philadelphia, and is part of the Philadelphia metropolitan area. The population was 28,043 at the 2010 census, down from 29,364 at the 2000 census.